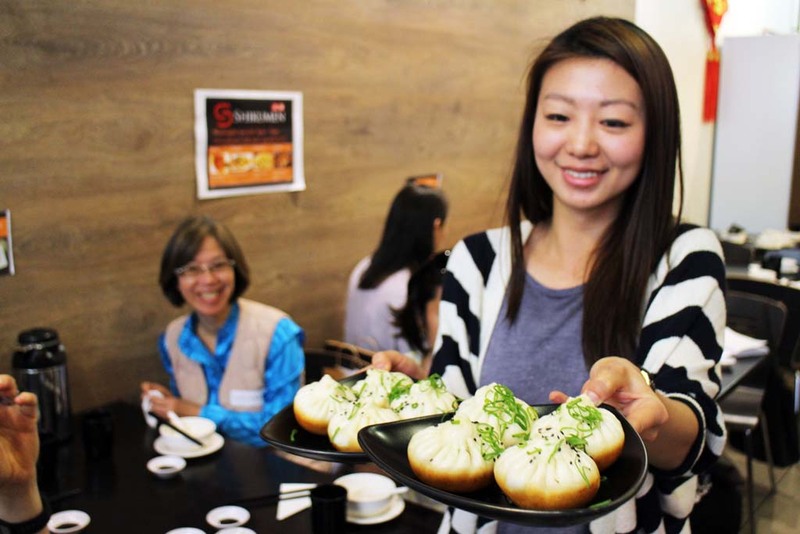 Taste Tours Cabramatta food tourwhere to next? 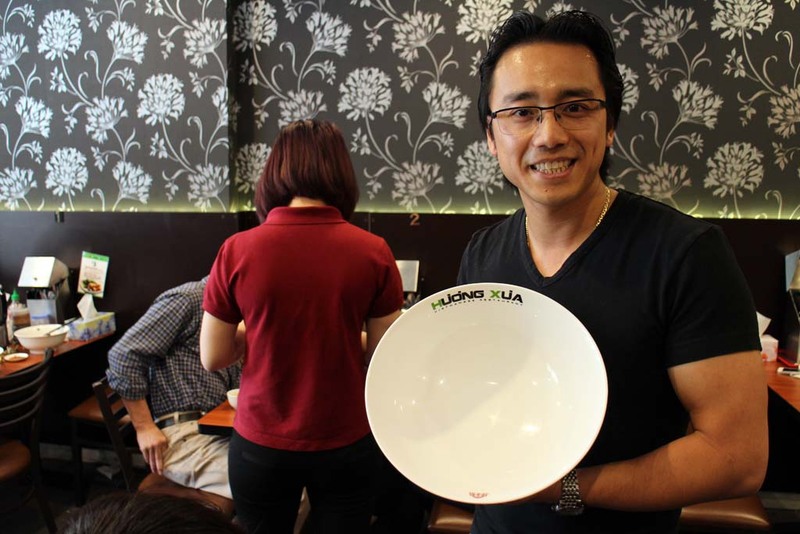 Restaurants in Cabramatta, Canley Vale and Canley Heights have put together a menu of Signature Dishes – the best of the best – making it easy for the uninitiated such as myself to find my way around the labyrinth of Vietnamese, Thai and Chinese restaurants in the area. Some of these dishes can be sampled on a Signature Dish Food Crawl over the weekend, a walking tour through Cabramatta which takes in some of the most famous establishments. 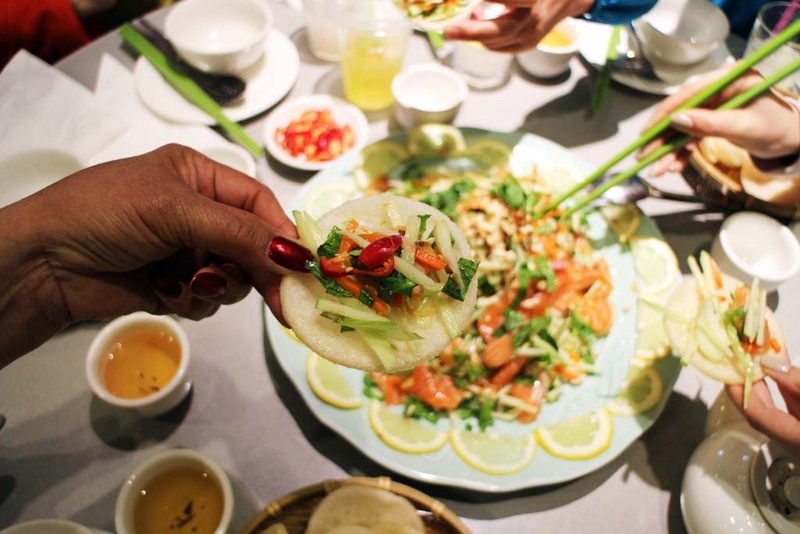 I got to sample this tour recently, and it’s given me a great introduction to the area – next time I come here, I know where to go for Banh Mi, Pork Buns and Pho – and for a few new dishes I’d not tried before which have very quickly made it into my Top 10 food experiences. 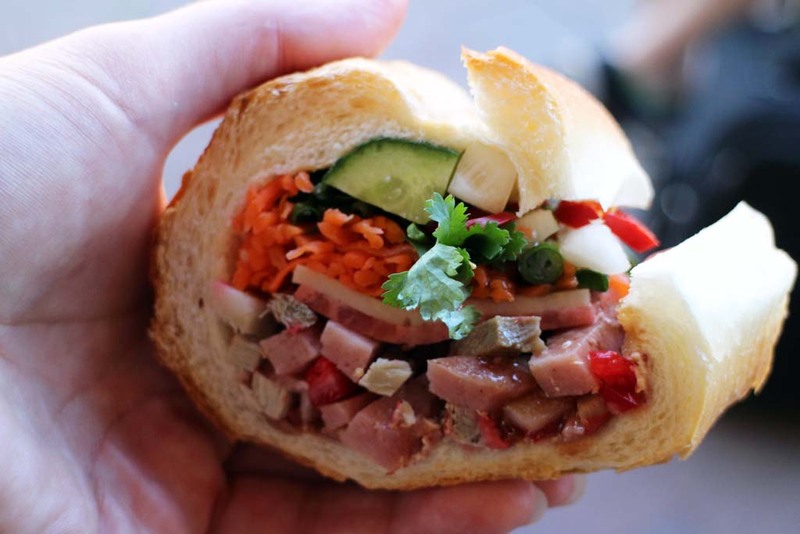 Our first stop is Vinata’s Hot Bread for reputedly the best Banh Mi (Vietnamese pork roll) in Sydney. 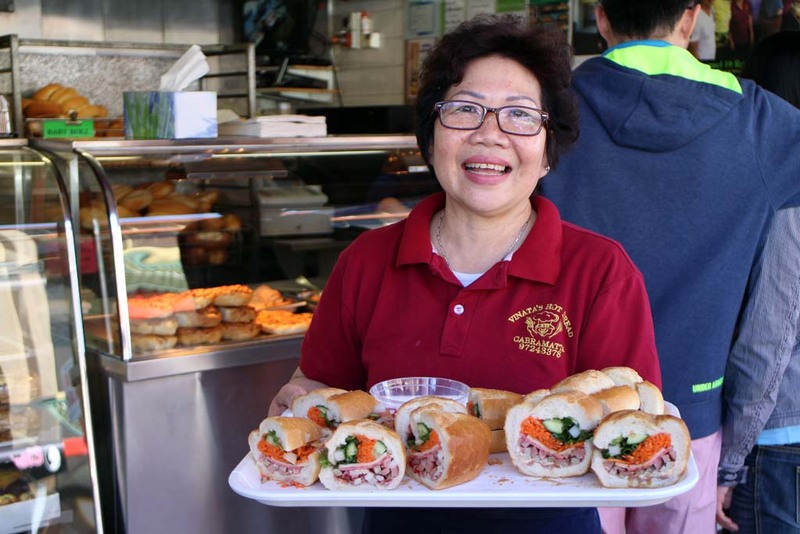 Vinata has been serving Banh Mi at her establishment Cabramatta Plaza for 30 years, and she certainly knows her stuff. They are delicious, just the right balance of, well, everything. I add extra coriander and chili (can never have too much coriander or chili) and there’s not too much bread in the rolls. If I didn’t have four more food stops to go I’d happily gorge myself on this. Next stop, after a tour through the local shopping centre, is Shikumen Shanghai, in BKK Shopping Centre, for a completely different kind of pork bun. The Shanghainese-style pork bun is steamed, then lightly fried, served soy, vinegar and a touch of chili. 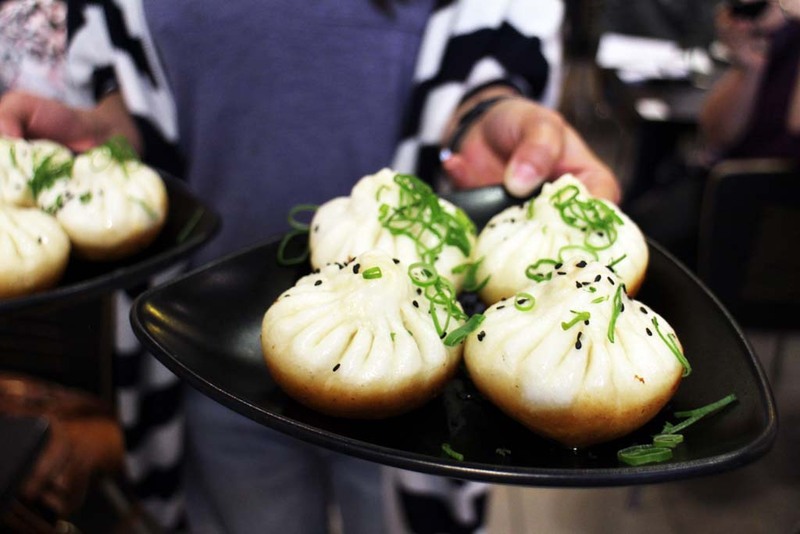 Restaurant owner Michelle Zhang has put together a menu filed with traditional Shanghainese food, and the closest comparison I can make of this taste sensation is the flavours at Taiwan’s most famous export, Din Tai Fung. Delicious. 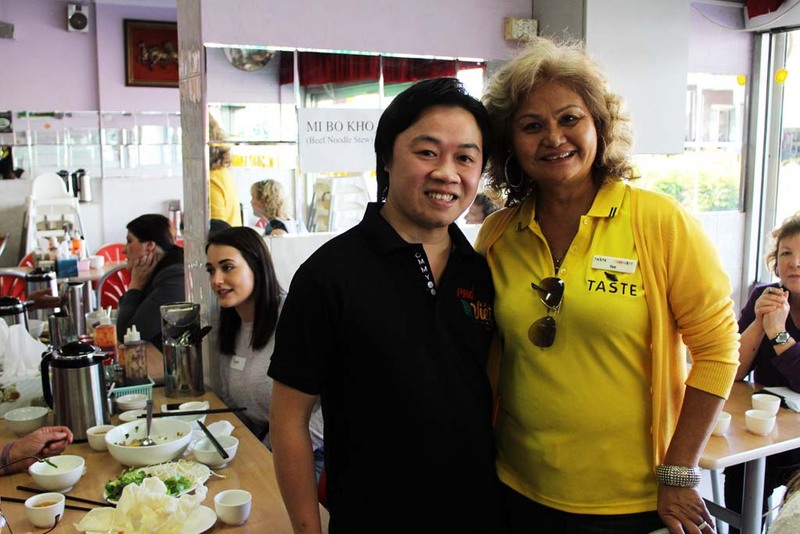 Our food train takes us next to Huong Xua Vietnamese Restaurant, where owner James Tran has prepared a taste sensation- this is probably the highlight of this food trail. This restaurant was opened in Cabramatta by James’ parents, Vietnamese refugees, and James worked here with his siblings after school and on weekends. The family now owns two restaurants, this one and one in Canley Vale, as well as a commercial kitchen. Reflecting James’ family’s roots, the restaurant specializes in Northern Vietnamese food, the type you might find in the streets of Hanoi. 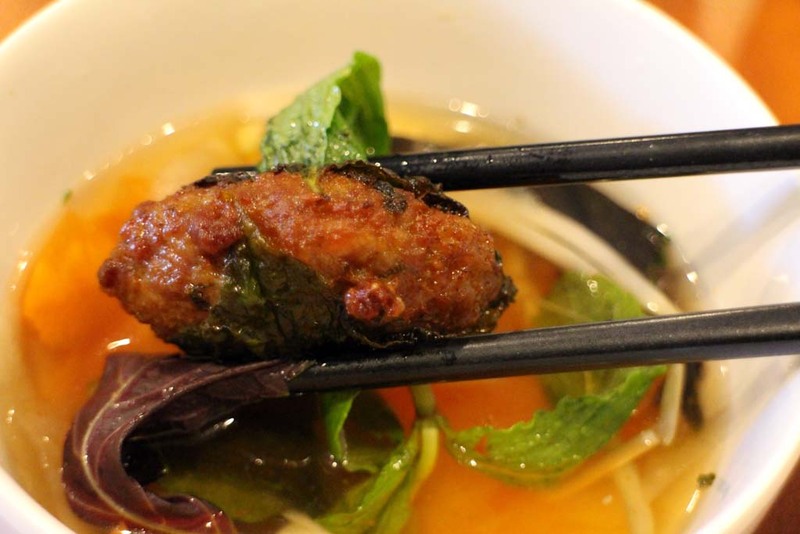 We’re served rice vermicelli with spring rolls and beef wrapped in betel leaf. 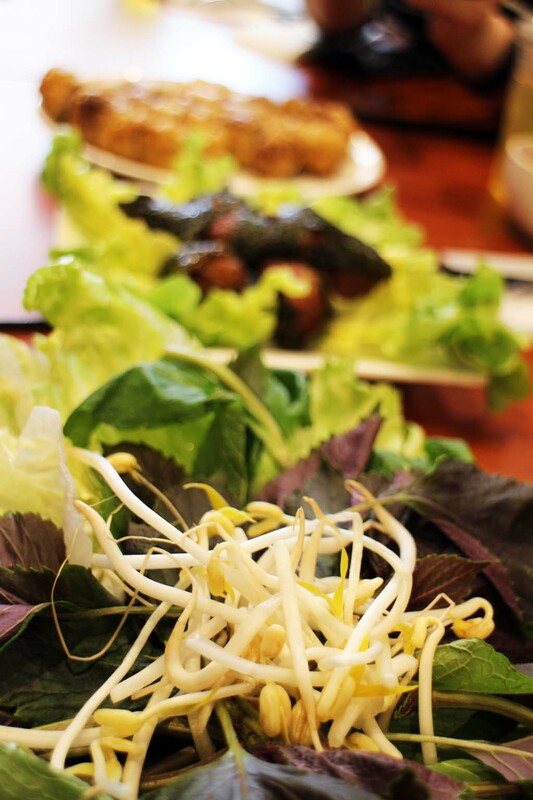 Both are served with a large sharing bowl of greens; betel leaf, mint, lettuce and beansprouts, and individual dipping bowls filled with seasoned, very mild fish sauce. The idea it to put a mix of greens in the fish sauce, pick up a piece of spring roll or beef, immerse it completely n the dipping sauce and pick it up with some greens to eat. This is a new taste sensation – I am definitely coming back for more. While we’re eating James also tells us about his Pho Challenge. Basically if you can eat the entire contents you get your meal for free, and if you manage to eat it faster than the current champion, extra accolades. The proceeds of James’ Pho Challenge are donated to the Miracle Babies Foundation. We waddle down the road for another taste sensation, Mike Thai’s raw salmon salad at Quan An Bau Truong. Again, light, fragrant, beautifully presented and served with large prawn crackers with which to eat it with. 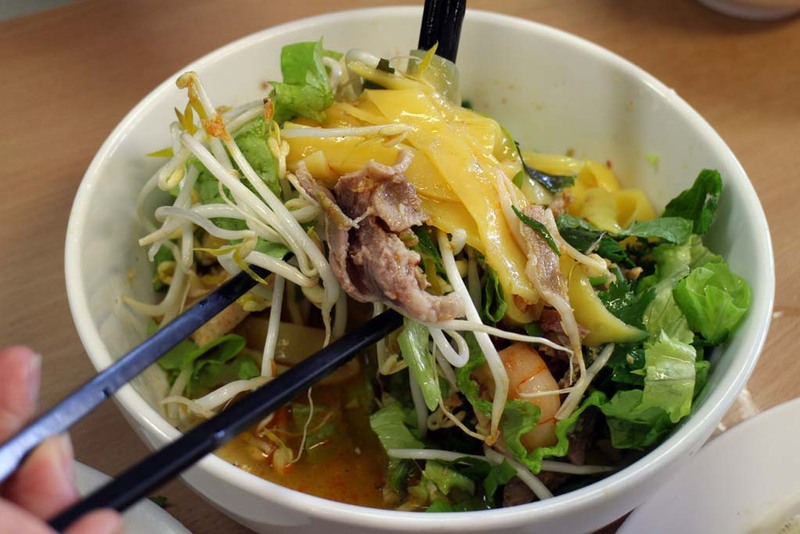 Our last stop on the Cabramatta food trail is Pho Viet on John Street – but not for Pho. The restaurant also specializes in a type of home made noodles typical of the Danang region of Vietnam. 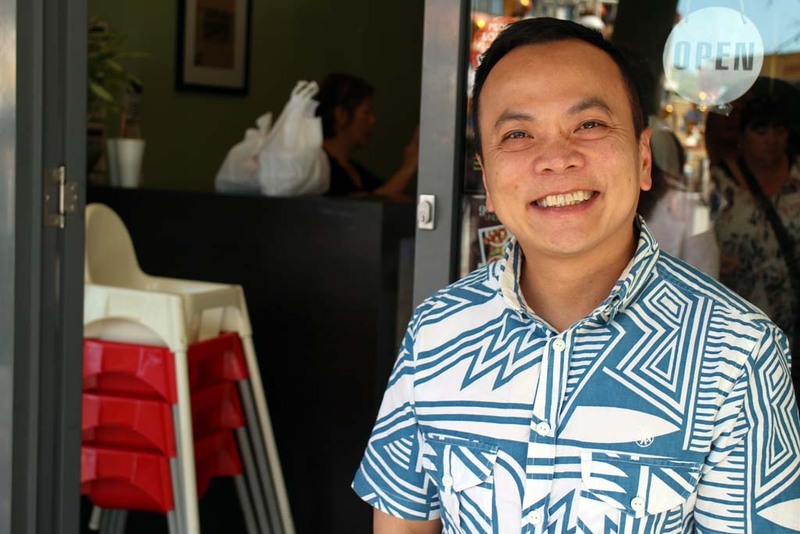 Owner Tri Phan and his family has been serving this dish; Mi quang nam, here since 1993. Having finished this tour I feel like each meal should have been given a lot more time and attention. But now I know where to eat when I visit Cabramatta. I can’t believe it’s taken me this long to visit. The food is all delicious, fresh and beautifully prepared, with quite a few new taste sensations for me, but what has struck me even more is the gorgeous people behind it, equally passionate about the dishes they create, and all so friendly and welcoming. I love them all and so do my taste buds. How incredible does that food look. I would love to do this. So delicious. I’m salivating just thinking about it. There is some great cycling around Cabramatta. Next time we are out there you have convinced we to stop for lunch.